The idea for this article came from a product idea posted to the FileMaker Community requesting native support for window IDs (https://community.filemaker.com/ideas/1169). In the comments to this Idea, David Wikström was kind enough to share a technique he uses to combine a binary representation of a window ID number with the window title using invisible characters. David's solution (which you can download from the Idea thread on the community site) uses a number of scripts and custom functions and stores data in several global variables using XML. Since version 16, I like to use the native JSON functionality instead of XML and I was inspired by David's work to change the storage mechanism to JSON. As I discovered when converting another utility solution (BrowserNav) to use JSON, it is possible to significantly reduce the number of global variables used for data storage as the native functions make it really easy to access the information we need. I also decided that I wanted to make adding window IDs as simple and lightweight as possible so that it can easily be added to an existing database. The window ID is really more like a layout number; it is a simple number based upon the creation order of the windows. So when you open a solution the the first window will have a window ID of 1. Open another window and it's window ID will be 2 and so on. These window IDs are stored in a JSON array with the index position in the array being the window ID. "open" : "2019-01-11 1:49:30 PM"
"windowMessage" : "Example of window scoped variable text"
So let's start by reviewing the contents of the JSON array. The first entry in the array is null as there is no window zero and it is just easier to use the window ID as the array index pointer. 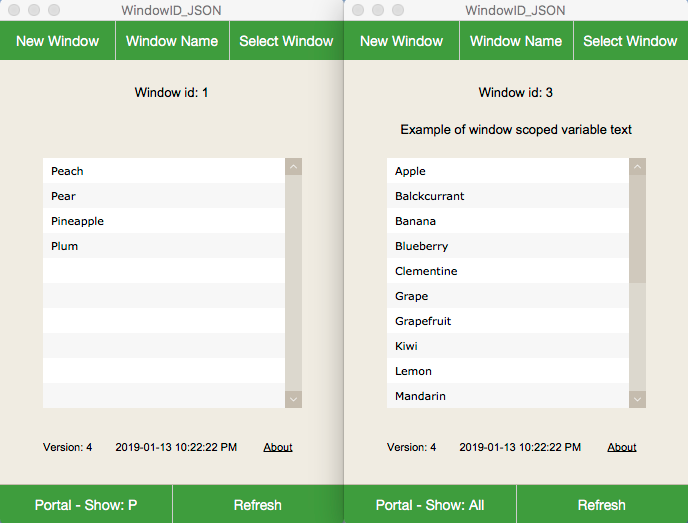 The JSON for each window also includes a time stamp for when the window was opened and in the case of window 2, a time stamp when the window was closed. I decided not to reuse the window ID of closed windows as it avoids the possibility of contamination (a new window picking up data from the array that belonged to the previous owner of that window ID). It also makes it easier to count the items in the array and add 1 to get the window ID of the next new window. The JSON for the first window contains the object “portalFilterValue” and the JSON for the third window includes “windowMessage”. These are examples of how this technique can be used to store window specific information. Whilst it would be nice to have variables that are limited to the scope of a window, it seems to me that this is a reasonable alternative that is available now. Now let's take a look at the windows represented by the above JSON which is stored in a global variable $$WINDOW.JSON. Win.Name( WindowID ) constructs the full Window Name with the invisible binary ID appended from the integer WindowID using the name stored in $$WINDOW.JSON David Wikström's brilliant idea to convert the Window ID number to binary means that we only need two different invisible characters instead of 10. Finally there is one FileMaker anomaly to deal with. The GTRR script step does NOT trigger the OnWindowOpen script when set to show the related records in a new window, so we need to run this ourselves to ensure the newly created window is processed correctly. Do take a look at the sample file; I'd be delighted to receive feedback and suggestions for improvement and optimisation. Finally, many thanks to Kevin Frank for the opportunity to post on filemakerhacks.com and to David Wikström for the initial inspiration to explore the invisible approach to window IDs. My plan is to review the demo file (taking into account any feedback to this article) and submit it as a module over at http://modularfilemaker.org. I will add a comment to this article when the module has been submitted. Afterthought: I wonder why FileMaker refers to “Window Name” everywhere except in the script step “Set Window Title”? Oddly the options for this script step also refer to “Window Name”!